The Shoreham Adur Tidal Walls scheme has been officially opened, with Sir James Bevan, Chief Executive of the Environment Agency, labelling it a ‘genuine success in partnership working’. The £45 million scheme was carried out by Team Van Oord, on behalf of the Environment Agency, Coast to Capital Local Enterprise Partnership, Adur District Council and West Sussex County Council. The project was designed by Mott Macdonald. 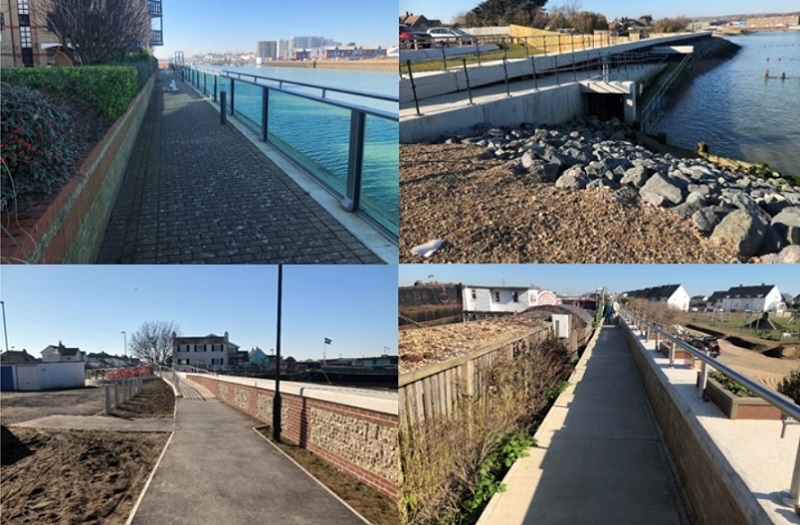 Work was completed in February 2019, significantly reducing flood risk to more than 2,300 properties in Shoreham and East Lancing – as well as protecting important local infrastructure including the road network, railway line and Shoreham Airport. “The Adur Tidal Walls scheme represents a genuine success in partnership working. Only by coming together and finding a solution to covering the costs have we been able to finance and build this remarkable engineering project. “Although we can never completely eradicate flooding, to so significantly reduce its risk to so many local homes represents an incredible achievement for Shoreham. Construction of the new 7.2km tidal defences began in September 2016, as many of the old defences came to the end of their useful life. The new defences cover 1.8km on the east bank of the River Adur between Coronation Green and the A27 road bridge – and 5.4km on the west bank between the river mouth and the A27 road bridge. They are formed of embankments, sheet pile walls, rock revetments, flood glass, and property level protection, and are designed to last for 100 years – though have been built so that they can easily be further raised after 50 years if necessary. The project also involved improving the public footpaths along the route of the defences, and approximately 1.4 hectares of compensatory saltmarsh habitat have been created. The Shoreham Adur Tidal Walls scheme has been universally praised by stakeholders and local and national politicians, including Jake Berry MP, Minister for Local Growth. “It is good to see how Coast to Capital have worked with the Environment Agency to protect local businesses at Shoreham through the reinforcement of flood defences along the River Adur. “The Adur Tidal Walls scheme will have an immeasurable impact on the residents and businesses in Shoreham and Lancing. “It will not only will protect our communities from future flooding but it also gives investors certainty, supporting the creation of new homes and workplaces while opening up the riverside to local residents.